Before we’d leave campus - Christmas vacation or spring break or summer vacation - our rowing coach would tell us, “You’re either getting faster or you’re getting slower. There’s no such thing as staying the same.” It was his way of inspiring us to train hard during those times. I’ve never forgotten it. More recently I came across two math equations that confers the same idea, with a twist. 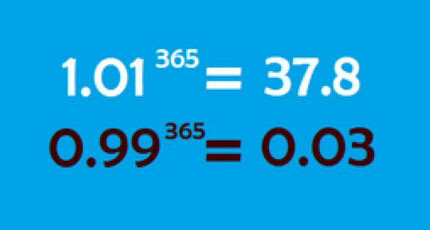 The compounding effect of improving every day. What if you could improve how you do something by 1% each day for a year? You’d be 37x better. What if your performance declined by 1% every day for a year. You’d lose 97% of your performance. It’s a reminder that getting just a little bit better every day has dramatic effects in relatively short periods of time. To bastardize Einstein: Compounding improvement is the most powerful force in the universe.